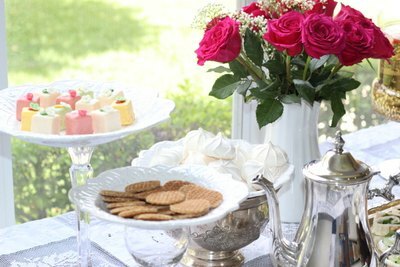 Tea parties are an all-time favorite for intimate gatherings with close friends and special celebrations. Follow these essential tips to host a successful tea party. First, set the date, time and location. Choosing a venue depends on the number of guests and the season. Tea parties are often held outdoors, especially during the spring season, when the weather is mild and the gardens are in bloom. However, indoor parties are just as popular. If you do decide to host your party outdoors, have a backup plan in case the weather takes a turn. Whatever you choose, plan on having a table and comfortable seating, where guests can sip on tea, enjoy their treats and chat endlessly. Seating arrangements depend on the type of tea party. Afternoon Tea is served between 2:00 p.m. and 5:00 p.m. Because this is a party held between meals, the food served is usually “finger food,” which can be eaten without cutlery and enjoyed standing or sitting away from a dining table. In this case, setting a dining table is not strictly required. For large parties, the food can be served buffet style and guests can stand or sit on chairs and couches set up in the area. Afternoon tea is also known as “low tea” because it can be served on a low table, like a coffee table, near sofas and chairs. 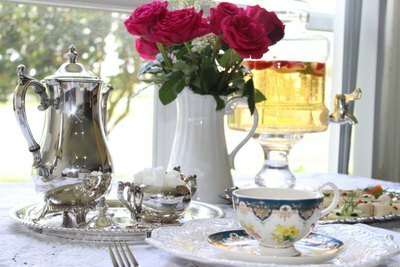 High Tea is served between 5:00 p.m. and 7:00 p.m. High Tea is sometimes known as “meat tea,” and a full meal is served. In this case, cutlery is necessary and guests should be sitting around a properly set table. The maximum amount of people that should sit around one table depends on the style of the party and how the food is spaced out. Generally, there is a 6 person maximum at a table so food can be easily passed around and shared. Alternatively, you can utilize multiple trays of the same food and place them every 6 guests. Use real teacups -- not coffee mugs or espresso cups. The teacup and saucers are the stars of your table. Use a variety of teacups at your table. Contrary to what you may have thought, the teacups do not have to match. Having china with different textures or patterns will add color and excitement to the table. 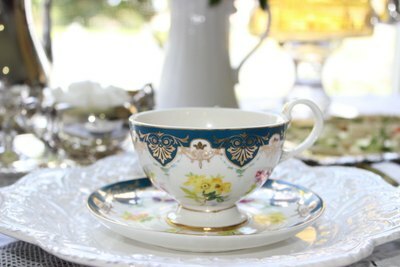 Place the teacup and its matching saucer on top of a medium-size plate. This will be used later when guests are enjoying their treats. Set each place with its own napkin and set of silverware. A butter knife or jam spreader is necessary for each guest if cream, butter or jams are being served. Set a glass, with or without stem, next to the teacup. Though it is a tea party, your guests may want to drink something refreshing, too. Add a feminine touch to your setting with fresh cut flowers. Make sure the arrangement or centerpiece is medium-size so it does not interfere with the view between guests. Alternatively, you can offset the arrangement once the guests are sitting at the table. 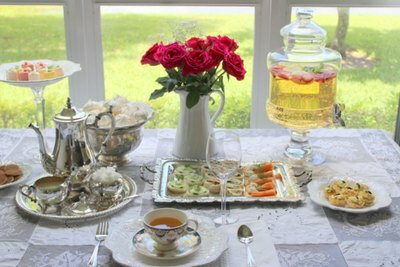 Add vintage chic charm by serving the tea in a teapot, treats on silver trays, and utilizing creamer jugs, sugar bowls and ceramic or porcelain teacup sets. 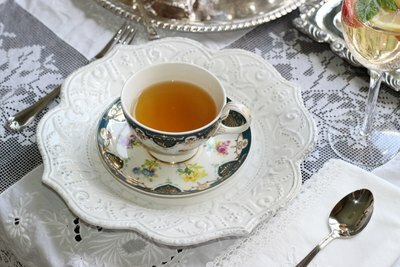 In the early 18th century, tea was a commodity only the wealthy could enjoy, thus forming the tradition to pour tea from silver teapots and serve food on silver platters. 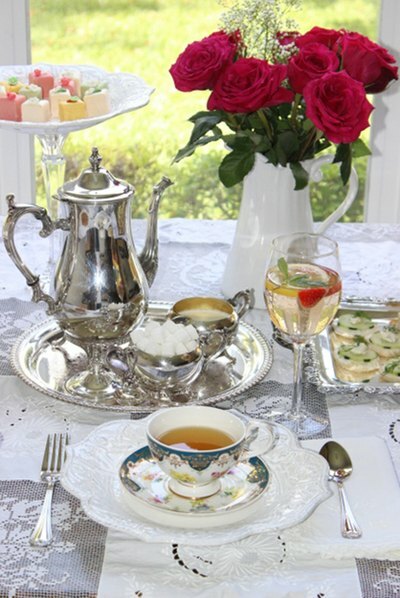 Today, traditional tea parties utilize porcelain or silver teapots. Although not strictly necessary, the three-tier stand is a typical tea table setting. Scones and breads should go on the top tier, sandwiches and other savory treats on the middle tier and sweets on the bottom tier. Because they are usually held mid-afternoon, tea party snacks are generally light on the palate. 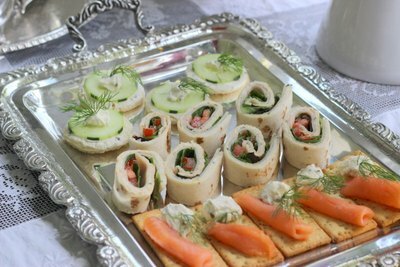 Examples of typical foods include cucumber sandwiches, smoked salmon and dill on toast, chicken salad cups, or turkey and cheese roll-ups or flatbreads. Typical sweet treats include shortbread cookies, Parisian-style pastries and custards. You can also try vanilla meringues, mini wafers with soft caramel filling, or petit fours. Hot coffee or hot chocolate should be served for non-tea drinkers. Refreshments, like sparkling water, flavored water, mocktails, fizzy drinks or other cocktails can also be served. 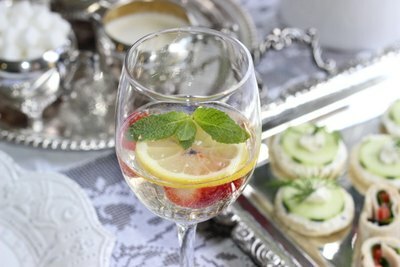 Try this: serve ginger ale with strawberries and sliced lemons garnished with mint for a pretty and refreshing beverage.